Introductory Call - Listen to Recording! This Fast Track to Cash Program is Designed for the New Investor Who Desires to Get Into the Booming Real Estate Business and Start Making Money Immediately! Plan to Do Your First Deal With Us During This 90 Days!! **Are you tired of living from pay check to pay check? **Are you a single mom who needs extra cash? **Are you ready to say good-bye to your J.O.B.? If you said “YES”, this 90 day program is just right for you! access to contracts, funding, scripts and so much more!! 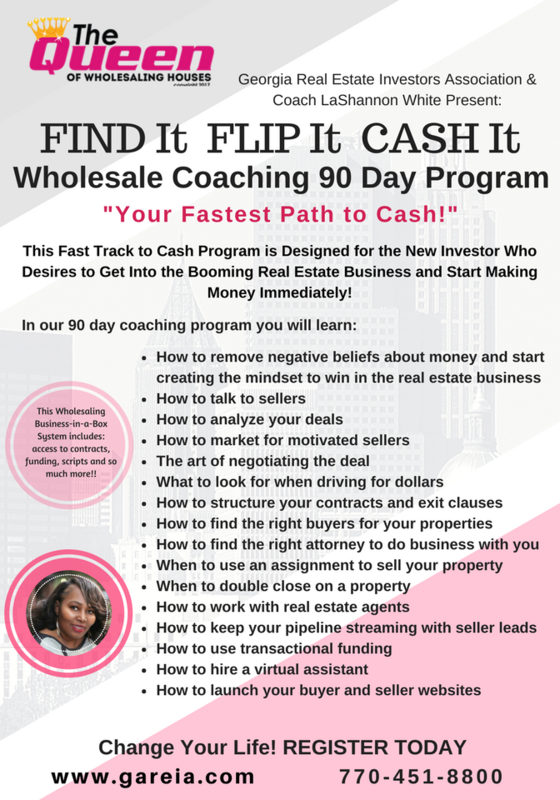 Your Coach will give you tools and access to her real estate team to close a deal during the 90 day program. You and your Coach will split profit 50/50! This conference call above is free of charge & recorded! 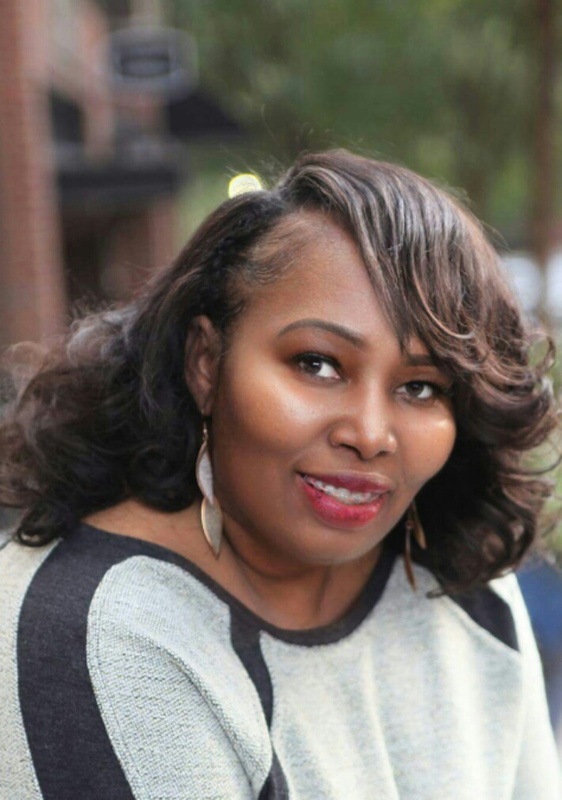 LaShannon White has been on the Path of Entrepreneurship since 1997. Leading up to that point, she had traded eight years of her life to Peachtree Staffing Services. From 1997-2004 LaShannon was the Owner / Operator of Sunshine Staffing Services. I was bitten by the real estate bug in 2004. I was determined to change my life. I closed my staffing agency and settled for a very small profit, just be able to walk away. The profit was only enough to live on for a month, so you can imagine my stress level at the time. With a husband who wasn’t making much money, and a little girl whom I loved so much, I knew my life could not become a success if I did not take massive action to make changes in my life. I started out in the real estate business with no experience, just like you. Believe it or not, when I started, no one in my local area was willing to freely share their experience on how they got started. All I wanted was a better financial life for me and my family, just like you. I couldn’t even pay for my daughter (now 18 year old) to go to her dance classes. I had to find a way out of my situation -- fast! One night I was watching late night infomercials and these two little guys came on. They were sharing their story on how much money they earned wholesaling houses! I sat there in amazement, watching and listening to these guys, telling myself that what they were sharing was too good to be true! I had never known anyone to make $5,000 in less than 30 days!!! I was willing to step out on faith and try my hand at wholesaling houses, because I had nothing to lose. I was already broke anyway, so when the number flashed across the TV screen, I dialed that number so fast, spoke to the live operator on the other end and told her I was ready to CHANGE MY LIFE!!! By the way, the seminar was FREE!!!! It was finally my time! I had finally stumbled across someone willing to help me!!! I went to the seminar that Saturday morning and heard the strategies that were presented and thought to myself, “I AM GOING TO DO THIS, AND GIVE IT ALL I GOT!! !” But, at the seminar they wanted you to pay for the membership and to buy the full course… and I had no MONEY!!! I started to feel defeated once again. Because there were not many people who attended the event, I was able to sit down with the Godfather of Real Estate, Ron LeGrand, and discuss a deal I had found and taken with me! Ron took the time to show me exactly what to do, step by step. I wrote down every word on a napkin, how to put together my first deal… step by step!! I did my first deal within 3 weeks of meeting the Godfather!! I was determined, and very, very hungry for a life change. My first deal landed me a big, fat check for $3,000! Yes, that''s right, $3,000!!! My 2nd deal was not as difficult because I was able to get the course and receive the training I needed to make the transaction smooth. I made my first $5,000! After my 2nd deal, there was no stopping me! I went onto my 3rd deal and by that point I was hooked for life! I was on my way to creating the life style and FREEDOM that this Real Estate business had to offer for me! So, if you think you can, you can! Since then I’ve closed over 80 deals and am an active Real Estate Investor in today’s market! I must credit Georgia Real Estate Investors Association (GaREIA) for having amazing speakers and boot camps to help me down this path! Important as well is my constant desire to be a student of this business and to learn as much about wholesaling to become a true success! Teaching others what I have learned has become my passion. Helping a student become successful and see them change their life, like I changed mine, inspires me every day! Real Estate will change your life! Just as it did for me! Now, both my daughters have a full-time mom, who can support them every step of the way as they grow and develop into successful young ladies. Payment Plan Available: split into 2 payments; first payment (50% of registration) due January 20; 2nd payment (remaining 50% of registration) due by March 3. Call to register if you want the payment plan; otherwise, register online, in person, or via phone 770-451-8800! Join us in January 2018! FIND It, FLIP It, CASH It! ©2018 LaShannon White. All rights reserved.